Venezuela is shipping gold to Europe so that it can pay its debt. Venezuela sent $1.3 billion worth of gold bars to Switzerland in mid-January, according to data from the Swiss Federal Customs Administration. That gold was shipped out just weeks before two big debt payments due this month, totaling $2.3 billion. On Friday alone, Venezuela has to pay bondholders $1.5 billion. Venezuela is running out of cash and many experts believe there's a high chance it will default by this fall when a string of big debt payments are due. 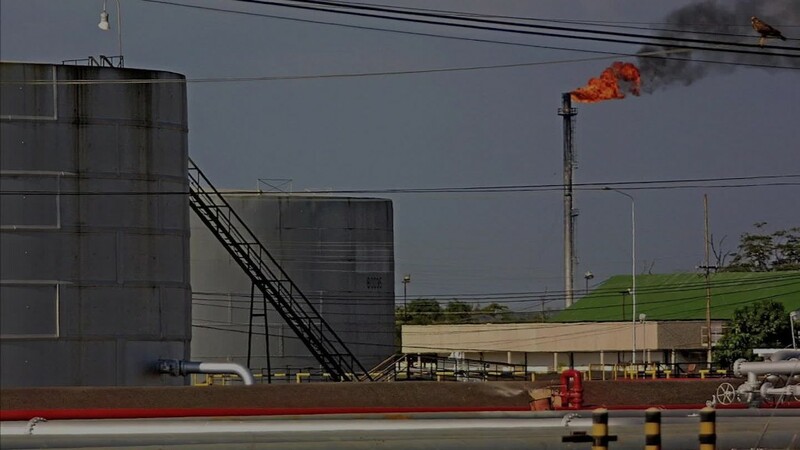 "It's a question of when Venezuela will default, not if," says Russ Dallen, managing partner at LatInvest, a firm that invests in Latin America. "They're running out of options." 1. Switzerland is one of the largest hubs for gold in transit and has the most trusted stamp of purity. 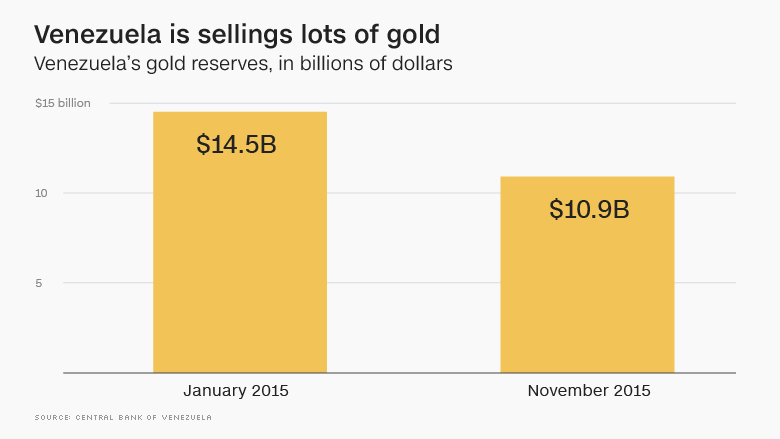 So once Switzerland verifies the quality of the gold, Venezuela can then sell it for cash. 2. Venezuela can also put up its gold as collateral in exchange for a cash loan from banks in what is known as a "gold swap." Some believe the second option is the more likely reason behind the shipment. Reuters reported earlier in February that Deutsche Bank and Venezuela were negotiating a gold swap. Deutsche Bank declined to comment and Venezuela's central bank did not respond to a request for comment. This shipment is pretty unusual. Gold is traded a lot, but countries usually keep their gold for safekeeping in places like the Federal Reserve Bank's vault in New York. When they trade gold, it usually goes from one vault to another. But Venezuela's late president, Hugo Chavez, brought the country's gold bars back to his country in 2011 and 2012, in a show of patriotism. 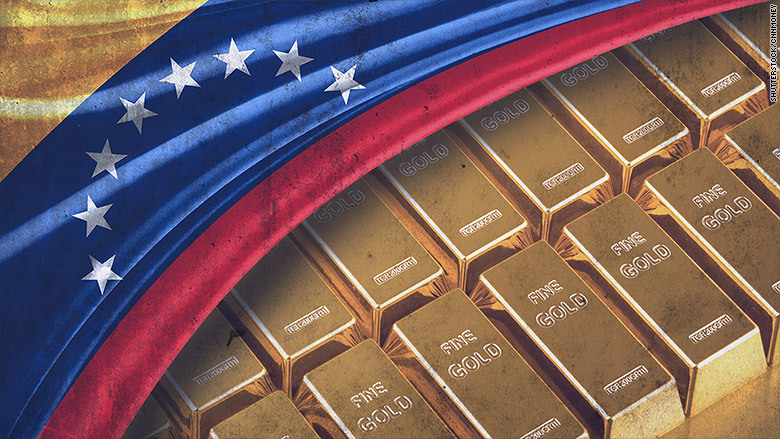 In the face of major debt payments and economic crisis, now Venezuela is sending its gold back to Europe. This week, Venezuela revealed that it's total reserves in November had fallen to $14.5 billion, the lowest level since 2003. Of that total sum, $10.9 billion is in gold. It has other reserves at the International Monetary Fund and in other precious items, like diamonds and silver. Related: Latin America: China's power play right under the U.S. Experts believe Venezuela has less than $1 billion in cash reserves. "There are not enough dollars to pay their external debts," says Mauro Roca, an economist at Goldman Sachs. "The economic environment is one of the worst in the world. It's clearly unsustainable." Any way you look at it, Venezuela is in a severe economic recession. Inflation is skyrocketing -- the IMF estimates it will rise 720% this year. Its economy tanked last year, shrinking 10%. The value of its currency, the bolivar, has plummeted. Default could soon be knocking on Venezuela's doorstep. In November and October, Venezuela must pay almost $5 billion in debt. Barring lots of help from China -- one of Venezuela's popular sources of finance -- experts believe Venezuela probably will default.